Lulu, Brooksie and Scrubbie are three rather unusual nicknames for which the 1930s actress Louise Brooks was known. She was a fascinating character and an air of mystic surrounded her sexuality which she seems to encourage. She had a number of relationships with both men and woman, the most famous bring Charlie Chaplin. She starred in over 20 films between 1925 and 1938 of which one of them inspired a hit single from 1991. Louise, who was born in Kansas in 1906, had a bit of a tough childhood because her father, a lawyer, spent more time with his business than he did with her and her mother, a pianist called Myra, apparently once said, “squalling brats she produced could take care of themselves.” In 1915, when Louise was nine, she was sexually abused by a neighbour and even when she told her mother, many years later, her mother said she probably brought upon herself. She began her career as a dancer in 1922 with the Denishawn modern dance company in Los Angeles. Her first major film role came in 1925 where she played a moll in The Street of Forgotten Men and many films followed over the next few years, but, arguably, she’ll be best remembered for her role as Lulu in the 1929 film Pandora’s Box and it was this film that inspired this week’s single. 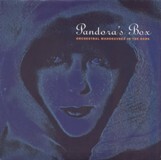 Pandora’s Box was a 1991 top 10 hit by Orchestral Manoeuvres in the Dark, a new wave band who first opened their chart career in 1980. Often cited as a duo of vocalist and bass guitarist Andy McCluskey and vocalist and keyboard player Paul Humphreys but throughout the eighties they had Martin Cooper as their wind instrument player and occasional keyboard player and Malcolm Holmes as their drummer. They had a brief sabbatical in 1990 and by 1991 the line-up was McCluskey, Nigel Ipinson and Phil Coxon as keyboard players and Abe Juckes on drums. The accompanying video is in black and white and features both Brooks and McCluskey. According to the missive at the start of the video, it explains that the original film was banned by Hitler who described it as ‘Degenerate art’, it goes on to say that ‘all the scenes of Louise Brooks in the video are from the original film’. It’s also one of those songs where the title does not appear in the lyrics. Brooks, who in 1995, was listed at number 44 on Empire magazine’s 100 Sexiest Stars in film history retired after her final film, Overland Stage Raiders in 1938 after which she went on to write many witty and clever stories on the film industry. She also opened a dance studio in Beverly Hills but due to scandalous stories surrounding her business partner it failed. In 1932 she filed for bankruptcy and began dancing in nightclubs to earn some money, but by 1940 she’d had enough and boarded a train bound for Kansas and left Hollywood behind. She remained comfortable for the rest of her life because, according to IMDB, she was briefly the mistress of CBS founder William Paley, who secretly provided her with a yearly pension for the rest of her life. Orchestral Manoeuvres in the Dark called in a day in the summer of 1996, but McCluskey carried on because in 1998 he founded the Liverpool group Atomic Kitten and co-wrote six of their hits including the chart-topping Whole Again. He later worked with the Lightning Seeds and Gary Barlow for which the pair wrote the song Thrill Me which featured in the 2016 Eddie the Eagle and was performed by McCluskey. In 2006 McCluskey reformed OMD with Humphreys, Cooper and Stuart Kershaw on drums. He explained the reason for the reformation was because his kids had never seen him on stage and it was their encouragement that inspired him to do it. He was divorced in 2011 and his American wife moved back to the States with the children. As for Louise Brooks, well as the video says, ‘she valued her integrity more than her success and she paid the price for her independent spirit. Her career was brief but brilliant. She died in Rochester, New York 8th august 1985, alone. She was 78.